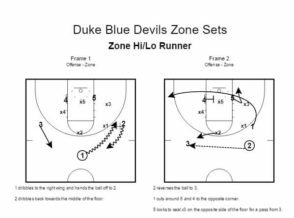 Attached are two zone set plays from Duke Blue Devils head coach Mike Krzyzewski. Coming off of a national championship in 2015, the Blue Devils are once again starting fresh with several players leaving for the NBA draft. The 2015 NCAA Tournament Championship marks the 5th for Coach Krzyzewski. He won his first two titles back-to-back in 1991 and 1992, won again in 2001, and won in a thriller over Butler in 2010. On top of the titles, Duke and Coach K have racked up 12 NCAA Final Fours, 13 ACC Tournament Championships, and 12 ACC Regular Season Championships. In 2015-2016, the Blue Devils face off against some tough talent including Kentucky on November 17th, VCU on November 20th, Indiana on December 2nd, and Utah on December 19th. 1 dribbles to the right wing and gives the ball to 2 on a dribble hand-off. 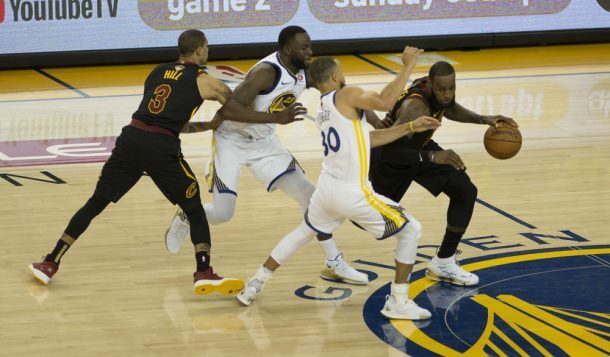 2 dribbles back towards the middle of the floor. 2 then passes to 3 and 1 cuts across the floor to the opposite corner as 4 screens the middle zone defender. If 5 isn’t open on the seal and 1 isn’t open in the corner, 3 looks to pass inside to 4. Once 4 has the ball, the middle defender has to make a choice on whether to stop 4 or protect the quick pass to 5. 1 passes to 2 on the wing as 3 cuts across the floor to the ball-side corner. 1 and 4 exchange spots forcing the defense to keep track of moving players. With 3 in the corner, x3 has to bump to the corner with x2 taking the ball on the wing. 2 passes to 4 forcing x1 to close out. 4 looks to make the lob pass to 5 sealing the x5 in the lane. Follow Coach Wes Kosel on Twitter!!! Wes Kosel is an assistant coach for men’s basketball under Head Coach Andy Partee at Colorado College in Colorado Springs, CO. Kosel joined the staff at Colorado College after serving two seasons as an assistant coach at Texas Lutheran University and one season at Haskell Indian Nations University. Kosel has an undergraduate degree in Exercise Science from the University of Kansas and a master’s degree in Physical Education from the University of Houston. He is a Certified Strength & Conditioning Specialist (CSCS) and Certified Personal Trainer (CPT), both certifications given through the National Strength & Conditioning Association. He has coached summer AAU programs, volunteered with elementary and middle school basketball teams, and has worked basketball camps for various programs including the Houston Rockets, USA Basketball, University of Houston, Colorado, New Mexico, Air Force, Texas State, and Texas A&M Corpus Christi. Kosel is also a member of the NABC International Committee and serves as the committee’s social media manager.